The chapter on Tea Gardening outlines a brief introduction on the “hot factor” surrounding tea these days as well as a breakdown of the various herbs you should grow for a variety of personal tea needs. This includes lavender, catnip, and lemon balm for sleep and relaxation. Stevia, mint, and lemon verbena if you’re craving a cup of “sweet and tasty” tea or perhaps nettle and rose hips if something a little more healing is in order. Apparently even dill has properties that can sooth an upset stomach and stimulate appetite. For crafty folks there’s a mini pattern and directions detailing how to sew your own tea bags from muslin. I think a supply trip to Target for seeds and cute pots is definitely in order. 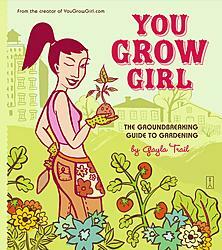 If you don’t currently own the amazing You Grow Girl guide there are plenty of online resources that will assist you in your tea gardening efforts. Happy growing!